With a continuously packed exhibition, ICFF 2018 was one of Gessi’s most notable displays yet, as major dealers and architects from the North American market stopped by to Experience the Gessi Private Wellness feeling embedded in the numerous new concepts and design presented. Design teams from distinguished architectural firms like Rockwell Group and Hirsch Bedner Associates (HBA) made it a point to stop by our booth to witness our latest products in tapware and shower accessories. For the first time in the US, Gessi displayed its sensational Private Wellness Program of advanced function showers as well as the new Rilievo collection in partnership with HBA, which is already receiving a warm embrace from designers and publications alike. Among the many press outlets who visited the booth, Interior Design Magazine stopped by to hold a video interview, discussing the success of the Inciso Collection. 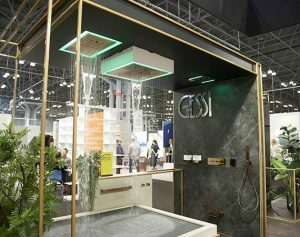 In addition to the many people who visited the Gessi booth, this year’s ICFF show was Gessi’s biggest show to date with the Gessi brand taking home Archiproducts Design Selection and the prize for best booth ICFF Editors Award. The Gessi brand continues to soar to new heights all over the world, particularly in the North American market.